I’ve been dieting master plants in the jungles of Peru, on-and-off since 2013; graduated into apprenticeship in 2016. Although I’ve had a huge range of fantastic and amazing experiences, many of which I’ve shared on my podcast, there was one kind of experience I haven’t had until my most recent dieta. 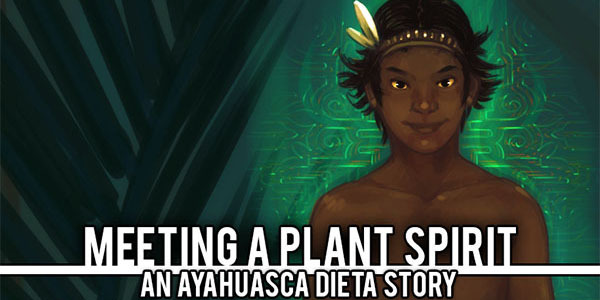 You see, for a plant shamanism apprentice, the real goal of the dieta is to connect with the spirit of the plant medicine being ingested alongside the Ayahuasca; to learn its lessons and make its spirit a permanent part of your being. The Ayahuasca itself is more of a ‘channel opener’ used to open you up to communication with this other, more subtle medicinal plant being explored. This spirit-contact can come while drinking Ayahuasca, in a daydream or in a dream while sleeping during dieta or in post-dieta. It can appear as an animal or other character, but most of the time takes the form of some kind of ‘person’. Even a non-apprentice dieter is entering into this journey with the plant being ingested, and may indeed meet the spirit of the plant without realizing its significance. Anyone in dieta is negociating some personal relationship with the medicine whether they know it or not. There’s a massive range of plants which can be dieted, and each one teaches different things, heals different things. There’s Bobinsana, which is said to open the heart and teach one to sing… There’s Chiric Sanango, which is a powerful immune system booster, and potent against fear… Roses, Garlic, Trees, Flowers, Roots, Bushy shrubs – The list is virtually endless! Some of these have noticeable physical effects, such as Chiric Sanango which makes one’s mouth and fingertips numb for a while, others can be psychoactive, but most have such subtle or non-existant sensory effects that they tend to go completely forgotten by the dieter despite ingesting it every day. Ayahuasca steals the spotlight, with its incredible displays, and leaves the poor teacher plant in the shadows unless one learns to listen for it. Back to the point: In all of my passed diets I’d encountered many spirits (Mother Ayahuasca, A giant, Forest/River beings, Many ancient shamans, Spirit-animals/insects, John Lennon…) but had never felt any of them were ‘the spirit’ of whatever plant I was drinking… I hadn’t had any experience that made me feel “Oh yeah, this plant is in me for good” – until now. It was probably 1-am, in the early afterglow of a mid-dieta ‘solo’ drink. The bulk of Ayahuasca’s multimedia stage-show had passed and I was enjoying the half-dreamy meditative state it had left me in. Along came this little vision-story that still warms my heart. 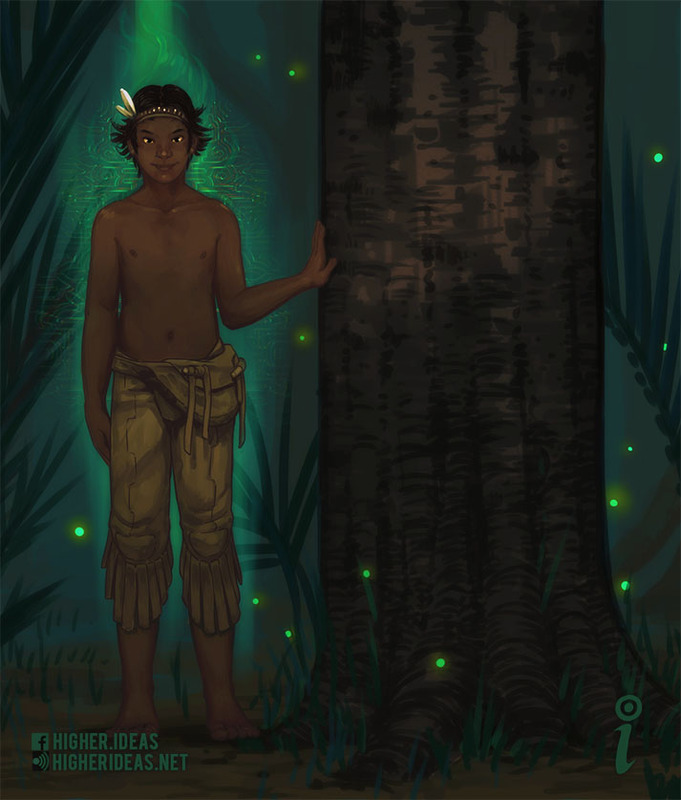 I was suddenly staring at the base of a towering tree in a dense jungle, with a large, sturdy trunk. As soon as I saw this tree, I recognized that I was watching myself; I was this tree, standing in my spot among so many others, just being me. Only moments later, I was surprised when along came a young wild-boy, wandering the forest. He looked to be 15-or-so, young enough to still need a mother anyway, but somehow I knew he’d been living alone in my jungle for a long time. He was none-the-worse for it, as he seemed perfectly content and sturdy, surviving on his own. He had a dark skin tone, a black mid-length tussled hairstyle, and a not-chubby-but-sturdy girth to his whole figure (especially in the legs). Yes, sturdy, he was a solid little adventurer, brimming with confidence! I distinctly noticed his seed-beaded headband which sported two short white feathers on the right side, and what seemed to be short leather pants. He was shirtless and barefoot. He just happened to be walking right by my tree, and as quickly as I saw him, he was already moving-on. But before he vanished, I found myself wordlessly calling his name with my tree-heart. The name I called was the name of the plant I’d been drinking all week. I still don’t know how or why I knew this would be his name, but his head immediately turned-back to confirm it and he came near my trunk with an air of curiosity. He put his hand on my smooth bark, and caressed me. It was still unclear whether he’d heard me call to him, or had just suddenly felt drawn to this random tree in the woods. He seemed to be appreciating something beautiful about me, as he took a long gaze up into my high branches. Decisively, he threw his leather belt-pouch to his rear side and jumped onto me. With the impressive agility of a monkey, he climbed my long, smooth trunk until he reached my branching canopy, high above the ground. Once up-top, he started scouting my many branches, apparently investigating how much of a fixer-upper he was dealing with, for a potential home. Meanwhile I continued beckoning him to stay, promising him a good home, love and protection. The vision passed and I returned to my senses. It didn’t take long for me to realize the importance of what had just happened. For the first clear time, I’d just encountered the spirit of my dieta plant, and successfully invited it within me! Significance was everywhere, as I thought it through. The young wild-boy, a jungle spirit, visibly strudy and self-assured: The most notable effect I’d observed from drinking this plant was an extraordinary stability, not only emotional and physical, but even in the perfect stillness of my eyes while drinking it. I could stare at the very tip of a leaf at the top of a tree for minutes, without a single one of those twitchy adjustments eyes seem to constantly make. The tree represented my body: A worsening problem somewhere in the high trunk matched-up with some gnawing issue I’d long been battling in my chest/shoulder/back, and the problems in the high branches were definitely the headache I was dealing with that week, along with the various frustrations and mental-loops that were wearing me down ‘up top’. And finally, the accepted invitation to make a home: Putting the two previous pieces together, what happened here was the plant’s spirit accepting to live within my body, and care for me as I care for it in return. The relationship a plant shaman makes with the plants they learn can take-on so many stories, masks, and forms, but what’s important is exactly that – Relationship. Connection. Union. For the rest of my dieta, I would randomly close my eyes and check-up on my little wild-boy. Later that night, I found he’d made himself a large bird-nest-like bed where all my branches meet, and was sleeping contentedly like a baby bird. In the day-time I found him clearing the large hole in my trunk of what appeared to be termites, and blowing smoke into the hole, which seemed to magically regrow my wood. I was even surprised to find him once sitting in his nest, playing a simple three-noted tune on some flute made from a gourd-like thing. I once blew tobacco for him, making my tree fruit beautiful flowers and sprout delicious fruit for him to enjoy. Along came moths and humming birds to decorate his world. I always smiled to see he seemed happy in his new home. Gracias, little friend. May we both grow well together and have many fine adventures! I hope you’ve enjoyed this little story, fellow-human, and hope it helps you on your own Ayahuasca journey.